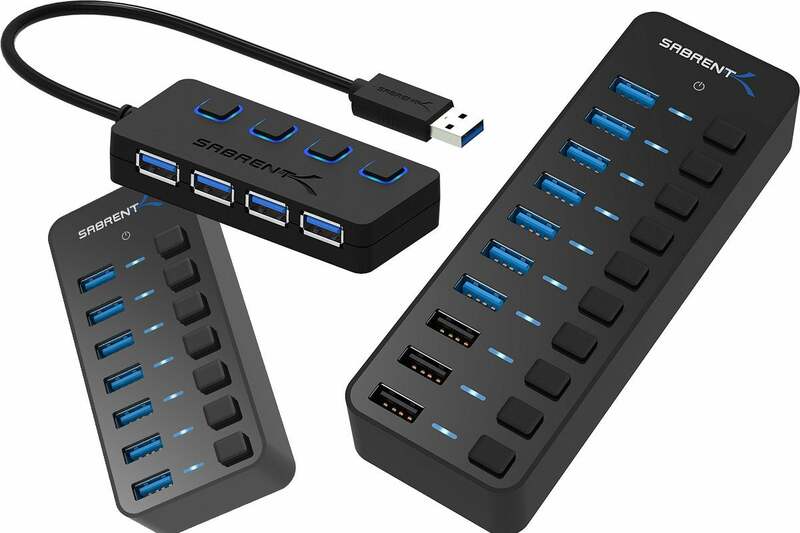 Add 10 ports to your desk for $30. No matter which platform you use, we all have one thing in common: our PCs never have enough USB ports. Whether you need to charge or transfer files, Amazon has four different options from Sabrent on sale todayRemove non-product link, so you'll be able to add as many ports as you need for super cheap. With individual power switches for port-by-port control and transfer speeds up to 5Gbps per port, these hubs all feature USB 3.0 ports that are backward compatible with USB 2.0 and 1.1. The biggest of the lot brings 10 ports to beef up your computer's connections for just $30Remove non-product link, a deep discount off its list price of $100 and the lowest price we've ever seen. Next up is a seven-port hub on sale for $22, another all-time low and a huge discount from its $100 MSRP. Along with the seven data ports, you'll also get three smart charging ports for keeping your devices powered up while you work. Also on sale is a standard seven-port hub for $20, a $55 discount off its list price of $75. Finally, Sabrent's classic four-port hub is $5.89 todayRemove non-product link, down from a list price of $23. It has the same USB 3.0 functionality and power status lights as the others with much greater portability, so you'll be able to connect your devices even when you're on the go.